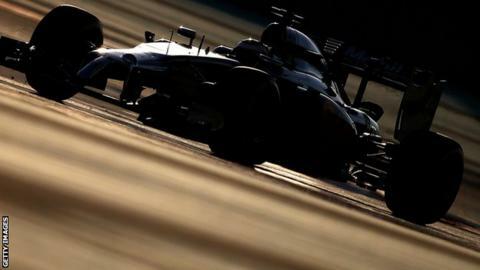 Formula 1 bosses are debating whether to make changes to the engine rules following a meeting with McLaren's new partner Honda. An FIA spokesman told BBC Sport: "The meeting went well and we are discussing matters that arose." The spokesman added that the meeting was "constructive". Honda's concerns surround a recent clarification on in-season engine development. The FIA's U-turn came about because Ferrari pointed out a loophole in the rules. A Honda spokeswoman said the company would not add to its previous statement on the issue "until we can get a further update from FIA should they reveal something". Its previous statement said: "Honda believes in fair competition for the goodness of the sport, and for our fans. "McLaren-Honda have contacted the FIA in regard to this issue, but we cannot discuss any details at this time." Insiders say Honda is "annoyed and unimpressed" with the situation. This could be done by allowing Honda to submit for official approval - or homologate - its engine on 28 February, as required, but then be given 32 tokens to develop it over the course of the season. Engine development is restricted to a specified number of 'tokens' each season. These tokens are ascribed to parts of the engine based on their influence on performance. From 2014 to 2015 - the second year of the new turbo hybrid formula - Mercedes, Renault and Ferrari can change 32 tokens out of the 66 that comprise the entire engine. For 2016, they can change 25 tokens; for 2017, 20; for 2018 15 and three each for 2019 and 2020.
hey can apply their 32 tokens at any point during the season, following a rule clarification which was introduced when it became clear no date had been defined in the rules for competitors to homologate their engines for 2015. Honda has no tokens to develop its engine during this season and in 2016, its second year, it will be allowed to change only 25 tokens. So it will never get the chance to change 32 tokens from one year to the next, as its rivals have. Last year, in their first year with the new turbo hybrid engines, Mercedes, Ferrari and Renault were restricted to supplying five engines per driver. This year, it is four. Honda can supply only four engines to the McLaren drivers this year, even though it is its first year. Has Honda's F1 return soured already?